Our academic program is designed to bring students rigorous, engaging instruction in a fun, joyful environment. We do that through a relationship-driven classroom culture, thoughtful use of data and a continuum of student supports. The foundation of our model is a comprehensive investment in teacher development. Teacher support and development is our priority. Our staff participates in professional development every Wednesday and have more than 250 hours of professional development each year. We ensure teachers have the space, resources and practice they need to excel before and throughout the school year. Our teachers participate in robust coaching cycles driven by concrete, manageable goals; frequent, aligned feedback; modeling and practice. We are nationally recognized for our teacher coaching model. Our teachers participate in outcomes-oriented planning meetings with school or central office experts. Planning meetings drive content expertise, outstanding lesson design and thoughtful collaboration with peers. Teachers drive student achievement. We believe effort and impact should be reflected in earning power, access to increased responsibilities, and opportunities for leadership. Positive impact on students is recognized. We have a formal teacher leader program that allows teachers to drive positive impact within and outside of their classroom. Our teacher leaders support colleagues with instruction, classroom management, cultural competence/context and mindset, building extracurricular programming. Our Apprentice School Leader program provides interested teachers with a path to school leadership. ASLs work closely with school leaders and take on meaningful projects. 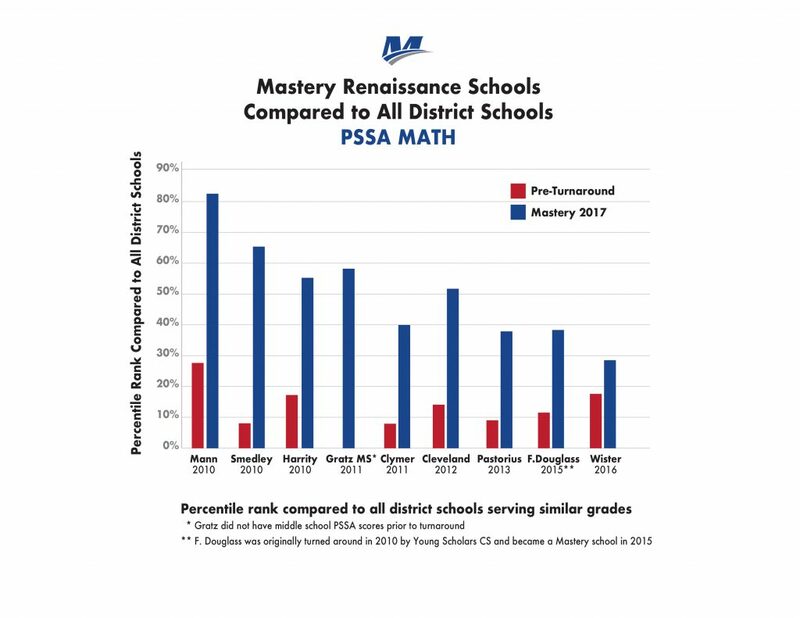 Mastery’s Common Core-aligned curriculum integrates instructional strategies and robust teacher support so all teachers can deliver engaging, rigorous instruction. See sidebar for Course Descriptions. Mastery’s school culture systems are designed to create joyful school communities that support students’ sense of belonging and the development of their independence and personal responsibility. Mastery intentionally develops grit and resilience in students by fostering a “success through hard work” culture. Teachers develop students’ “growth mindset”, encouraging them to persevere through difficult work and providing them opportunities to lead. We believe social-emotional skills can be explicitly taught and nurtured. At the elementary level, social emotional skills curricula is integrated into the regular school day. At the middle and high school level, students take social emotional courses focused on decision skills, conflict resolution, and emotional self-management. The capstone to the program is a required 18-week workplace-based internship for all secondary students in either sophomore or junior year. We believe that culture, race, and identity strongly influence how we teach, how students learn, and how the school community interacts; we also believe the cultural backgrounds of our students and families are a source of strength and opportunity. Consequently, Mastery has initiated a comprehensive training program to develop staff’s ability to be aware of – and responsive to — cultural, racial and individual identities. We believe candid conversations about race and bias create a healthier and more effective school community. All school-based staff members participate in professional learning communities (PLCs). These peer-led, small groups are designed to facilitate thoughtful reflection about teaching and the larger context of their work and effectiveness as teachers. The ultimate goal of the PLCs is to positively influence staff members’ relationships with their students. We value data. Teachers implement daily, informal checks to ensure students are understanding the material and formal end-of-quarter assessments to gain insight into concept mastery, growth and gaps. Data analysis informs daily lessons, report period goals and targeted student supports/differentiation. Robust data systems and reporting tools put actionable information into teachers’ hands. 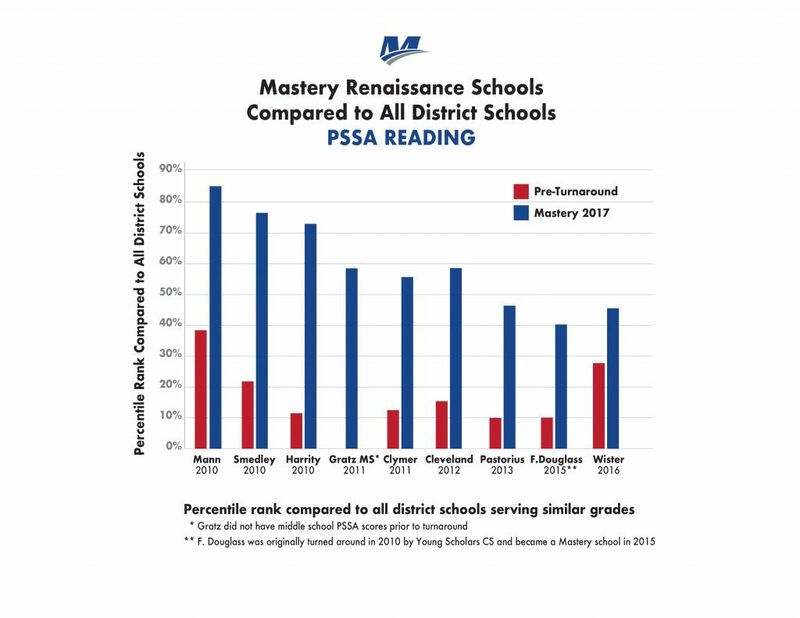 At Mastery, we believe all students can learn and achieve. Our schools offer a variety of approaches to support learning and development across a diversity of student needs. We meet students where they are and ensure they have the proper supports and systems to leverage their strengths and potential, and accelerate learning. We have developed a comprehensive safety net to ensure all students succeed. Serving all students with excellence.